White label test pressings are out there and in August 2003 a white label test pressing copy was sold on Ebay. This test pressing had a complete white label without any handwritten notes, the engraving in the run off grooves are WIK 2-A 1 and WIK 2-B 1, and the sleeve was a black and white Record + Tape Exchange carton cover with the address of the four shops printed on the front. 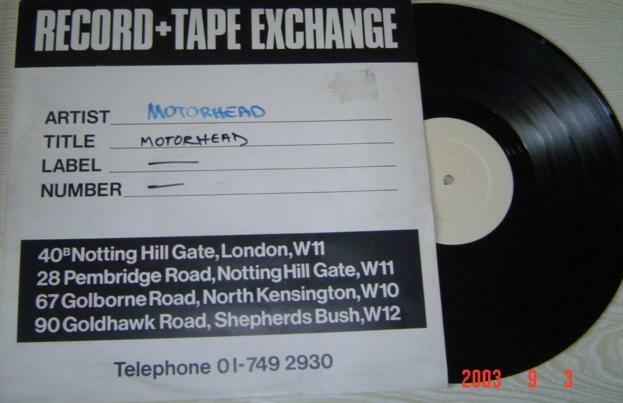 Motorhead is handwritten on the front cover and on the back cover the song titles are handwritten. Another test pressing of the WIK 2 was sold in March 2004 on Ebay. This also had completely white labels without any notes or stamps and a white sleeve with an A4 photocopy of the regular back sleeve (with the correct spelling of “Keep Us On The Road”) stuck onto the white outer sleeve. In June 2009 Paolo in Italy sent me a picture of a Test Pressing. Matrix numbers were "WIK 2-A 1” and “WIK 2-B 1. It was housed in a regular sleeve but with a white inner sleeve. In June 2011 a stock copy with Factory sample sticker was sold on Ebay (GBP 59). Sometimes test pressings of CWK 3008 are sold that are housed in WIK 2 sleeves so beware of this if you see a test pressing listed as a WIK 2! side 1: “WIK 2-A 1” side 2: “WIK 2-B 1”.